Camille Pannell passed away peacefully surrounded by her loving family on Friday, April 5, 2019 at 12:40 pm from complications due to liver failure. She was born June 12, 1952, to her loving parents Dee Thomas Bradshaw and Rita Dye Bradshaw and had 8 brothers and sisters: Ann, Reese, Madalon, Susan, Thom, Tony, Kevin (deceased) and Faye. She lived and attended school in Melba, Idaho. 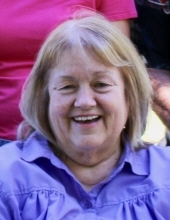 She graduated in 1970 and married Don Pannell in the Idaho Falls Temple on April 20, 1978. Before she married she attended beauty school and worked as a bank teller. After marriage, her most treasured job was being a mother. She raised 10 beautiful children and fostered 50+ more. She loved being a fulltime homemaker and having children around her while serving in her church and community. She is survived by her husband Don of 41 years; 10 children; 21 grandchildren and many nieces, nephews and cousins who loved her dearly. Viewing at the Church from 9:00 to 10:45 a.m. prior to the services. "Email Address" would like to share the life celebration of Camille Pannell. Click on the "link" to go to share a favorite memory or leave a condolence message for the family.